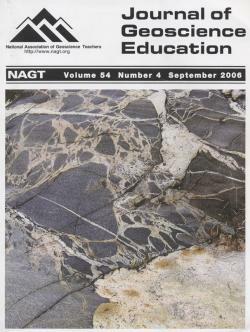 On the Cover - Lower Proterozoic migmatite with ductile stretching of brecciated blocks along a "subducting" shear zone. Finnish coastline just west of Helsinki at site of former Soviet submarine base. Jeffrey K. Greenberg, Professor and Chair, Dept. of Geology and Environmental Science, Wheaton College, Wheaton, IL. Student learning in the geosciences is enhanced by exposure to geology "in the field," where students put knowledge into practice to solve problems and make interpretations. Nonetheless, geography and cost may limit the ability of many institutions to provide adequate field experiences for their students, especially in large introductory courses. However, institutions may transform portions of their campuses into geological learning environments conducive to instruction at all levels by constructing mock outcrops. On our campus, we have constructed a variety of mock outcrops that range from simple groupings of lithologically distinct boulders to a complex "campus geological area" encompassing a variety of igneous, sedimentary, and metamorphic rocks, various artificial unconformities, and simple to complex structural relationships. Students from all instructional levels utilize the contrived geology that we have constructed and results indicate enhanced student learning as an outcome. By learning from our experiences, including the successful and unsuccessful events that helped us develop our campus as an educational tool for the geosciences, others may be able to better develop their own campus in support of geoscience instruction. This paper examines the results of a two-year study of preservice teachers' development of self-efficacy. Specifically, we explain how 2 of our original 12 preservice teachers implemented an activity from the Earth Links Project and present data describing how it impacted their self-efficacy. These two prospective teachers elected to do a space science lesson called Alka Rockets with students during their field experience. The purpose of the lesson was to help younger students understand physical changes and older students understand the principles of Newton's Third Law. Both preservice teachers and students used the scientific method and learned the importance of observation and random trials. These prospective teachers also used the video Apollo 13 to reinforce the mathematical concepts of place value and numeracy. Most importantly, they learned how to improve their instruction in space science by reflecting on their practice. A solid waste landfill siting exercise has been developed for an introductory environmental geology course. Students are asked to site a county landfill using the actual state guidelines developed and enforced by the Wisconsin Department of Natural Resources. The students work in small groups and synthesize information from a variety of resources, including maps of geology, hydrology, land use, and topography. After choosing a site, students explain the benefits and drawbacks of the chosen location in oral and written formats. The exercise asks students to draw on a variety of topics and skills explored earlier in the term and to apply them to a real-world environmental problem. It has been successfully implemented as a capstone project at a liberal arts college and a large public institution. Entire fields within the Earth sciences now exist in which computer modeling has become the primary work of the discipline. Undergraduate geology/Earth science programs have been slow to adapt to this change, and computer science offerings frequently do not meet geology students' needs. To address these problems, a course in Computer Modeling in the Earth Sciences has been developed at Vassar College. The course uses the STELLA (Structural Thinking Experimental Learning Laboratory with Animation) iconographical box modeling software to teach the fundamentals of dynamical systems modeling and then builds on the knowledge students have gained with STELLA to teach introductory programming. Modeling topics include U-Pb concordia/discordia dating techniques, the impact of climate change on a chain of lakes in eastern California, heat flow in permafrost, and flow of ice in glaciers by plastic deformation. The course has been received enthusiastically by students, who reported not only that they enjoyed learning the process of modeling, but also that they had a newfound appreciation for the role of mathematics in geology. Fully documented and debugged STELLA and Fortran models along with reading lists, answer keys, and course notes are available to anyone interested in teaching a course such as this. It is standard practice in satellite remote sensing of earth objects to field check imagery by locating specific places or objects using GPS (Global Positioning Systems). After teaching remote sensing courses for three years, and introducing GPS in them, it became clear that many of my students did not learn GPS technology well enough to successfully ground check satellite data and therefore a more effective way of teaching GPS was needed. Inspired by the common hobby of geocaching, I created a new fun and engaging activity for my university courses and teacher courses: the GPS treasure hunt. Two variations of the hunt have been undertaken with 297 teachers and students over four years. The results and impact of this activity have been overwhelmingly positive. Specific GPS-oriented questionnaires administered in several of the courses indicates that 34% of respondents had never used GPS units until completing the activity. After completing the hunt, 89% proclaimed that they felt comfortable using GPS units and would be able to find the location of any given object after the activity. Since introducing this activity, no student has required additional assistance in subsequent exercises that require the use of GPS units. A studio classroom involves few traditional lectures. Instead it emphasizes collaborative/cooperative learning and active learning. The instructor acts as a facilitator while the students work together to learn. In Geology courses involving petrographic microscopes, engaging students in cooperative learning may be problematic. Microscopy traditionally involves individual students using seperate petrographic microscopes. Digital microscopy using digital cameras to provide live video feed to a video monitor can help change a microscopy lab into a studio-style classroom. Students can work together on labs, teach each other to identify common rock-forming minerals, and piece together geologic histories and environment of formations in a highly collaborative environment. Once students adjust to the classroom environment, studio-style work carries over easily into class activities that don't necessarily involve the microscope. Studio classrooms promote higher test scores and students learn the importance of group work and in class presentations. Robert L. Garfield, Hager-Richter Geoscience, Inc. The emerging subdiscipline of hydrogeophysics is underdeveloped in undergraduate curricula relative to its importance in professional engineering/ environmental practice. In 2001, the Bucknell Department of Geology initiated efforts to refocus an undergraduate geophysics course on near-surface geophysical methods for hydrologic, environmental, and engineering problems. In addition to offering students practical experience, treatment of hydrogeophysics provides important pedagogical opportunities. Field-based hydrogeophysics labs challenge students to integrate concepts from other geology courses, as well as from physics, math, and chemistry. We faced two challenges in revising our geophysics course: (1) access to wells for field exercises on borehole geophysics; and (2) the costs of acquiring and maintaining equipment. We pursued two strategies to solve these problems. First, we established an on-campus well field, which serves as a field laboratory for downhole and cross-hole experiments. Second, we incorporated field demonstrations and lectures by professional geoscientists, including alumni, into our courses. By adding field exercises to our syllabi and promoting undergraduate research, we are building a cutting-edge dataset that includes televiewer and standard wellbore logging, cross-hole tomography, and hydraulic-test data. Student-led analysis of these data has already provided valuable insights into the control of fractures on aquifer properties, and these observations are being combined with outcrop studies to place our results in a more regional context. This paper describes a scale-model classroom experiment that illustrates several fundamental concepts in sedimentary geology and hydrology, speaks to relevant societal issues, and provides an inexpensive and straightforward demonstration for single to multiple classroom period(s). The model simulates the cross-section of an earthen dam and reservoir system using a flat acrylic tank (ant farm dimensions). The dam is constructed by pouring sand into the middle of the tank. During this process, visible grain-size sorting occurs, and the concepts of gravitational settling, superposition, and angle of repose are illustrated. Water is poured into the reservoir side of the dam, and the concepts of porosity and permeability are illustrated as water seeps into the dam. The initial water movement is dominated by capillary flow in the fine-grained layers, whereas flow in the saturated state is dictated by differences in permeability and hydraulic head. Water is observed to move uphill, and then downhill, following bedding orientation. The possibility of toxic waste storage in dams is evaluated by injecting water with brightly colored dye into the dam. The dye illustrates the movement and ultimate fate of the 'toxic waste', and forms a coherent pool on the downstream side of the dam. The grand finale occurs when the dam is overtopped by water and catastrophically fails. The experiment is suited for teaching K-12 and college undergraduate audiences, has been universally well received by students and teachers, and leaves lasting visual impressions of processes in sedimentology, hydrology, and environmentally relevant water issues. As geoscience educators, we focus on helping students understand technical content and learn to think like geoscientists. Although research substantiates writing as a tool for teaching technical content and disciplinary thinking, geoscience educators often do not integrate writing in geoscience education because of the frustrations and exigencies involved. To address these issues, this paper describes the literature on using writing as a learning tool in both cross-disciplinary and geoscience teaching contexts. Further, we describe our Less is More approach, designed so faculty can spend less time grading student writing and still yield more learning benefits from incorporating writing. This approach involves five strategies, including explicitly integrating assignments with course objectives, designing effective assignments, incorporating process writing, evaluating writing effectively and efficiently, and consulting appropriate campus resources. Results of an initial assessment using this approach with a geoscience course suggest gains in student learning. 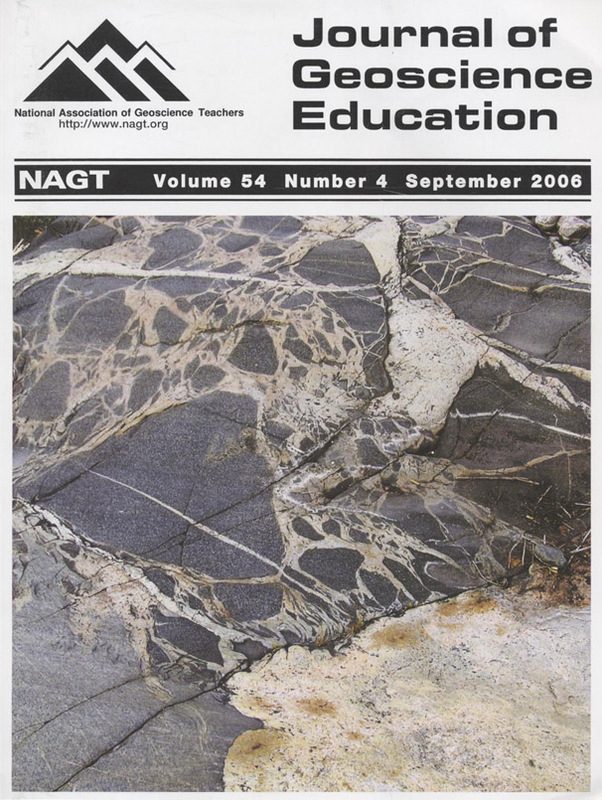 This article describes a project in which fourth graders investigated principles of stratigraphy by creating colored sand layers in a clear-sided container and observing photographs of cross sections of snow layers and rock outcrops along roadsides. Students used the National Science Education Standards unifying concept of "evidence, models, and explanations" to investigate stratigraphic principles of original horizontality, superposition, and crosscutting relationships. A pretest/posttest evaluation of the lessons showed that students learned basic concepts of stratigraphy. This article describes a mathematics-science integrated lesson for fourth grade students involving inquiry into how natural sand towers form. Natural sand towers are finger-sized pillars of sand that form on beaches underneath frost-heaved slabs of frozen sand during a thaw. As the sand-ice slabs melt, water drips from the lowest points of the undersides, depositing a pillar of sand on the floor of the "cave" below. Seventeen fourth grade students participated in the lesson by observing photographs of the phenomena, making hypotheses, investigating a model, and producing sand towers by dribbling wet sand of two types. Mean, median and mode were determined for height measurements of the sand towers. Students showed significant gains from pretest to posttest in understanding the scientific method and calculation of different types of averages. Learning about landforms is an important part of earth science instruction in the elementary grades that has been identified as needing improvement. Three research-supported experimental approaches were compared in a counterbalanced-design study conducted on three sets of landform words with second, third, and fourth grade students (N = 53). Because many geomorphology terms have multiple meanings that lead to misconceptions and learning difficulty, the vocabulary of the study focused on thirty words that have both an everyday meaning and a landform meaning. All students viewed an electronic slide show of photographs and definitions of landforms accompanied by explanations of landform processes. Then they attended lessons under the different conditions for the same amount of time. In the object box condition, students created a layout of objects, papier-mâché landform models, photographs, definitions, analogy cards, and mnemonic device cards that related the two meanings of each term. In the second condition, students created landforms in sand or dough and labeled them. In the third condition, students created and performed puppet plays that explained the landforms. Results show that the object box condition was favored above the sand condition and the puppet play condition, although long-term retention of information was good in all three. Microfossils, and especially foraminifera, are a valuable tool for paleoenvironmental interpretations in coastal regions. Despite their utility, teaching of applied micropaleontology in undergraduate courses is limited by the difficulty of identification of some taxa. Students in the University of North Carolina Charlotte's Coastal Processes and Environments course were required to differentiate downcore paleoenvironments from back-barrier marshes near Charleston, South Carolina. Although lithology was useful for interpreting paleoenvironments, sediments, combined with a simplified approach to microfossil identification, proved most useful for determining depositional environments. Students used Civil War maps and global positioning satellite technology to locate an 1860's tidal inlet. Gouge-auger cores and foraminiferal analysis were used to stratigraphically confirm this strategically important inlet. The back-barrier marshes of Folly Island, South Carolina, is ideal for undergraduate foraminiferal research for two reasons: 1) Offshore outcrops of Oligo-Miocene strata provide foraminifera that act as a natural tracer for washover sediments and differentiate washovers from flood-tidal delta deposits and 2) morphologically distinct agglutinated foraminifera, such as M. fusca, simplify the identification of low- and high-marsh subenvironments.